Both Tebow and Lynch were quarterbacks in college, putting up ridiculous numbers in offensive systems that simply haven’t translated to the NFL. Both were finalists for a Heisman Trophy, though Tebow at least won one before serving as a bridesmaid. Neither of them will be successful quarterbacks on the NFL level, though Tebow at least got a chance to. And despite their lack of success at the NFL level, the media spends far more time writing about them than anybody else, though in Lynch’s case, it’s the local media. Have you noticed it since the NFL Draft last week? Ever since the 2013 season ended we’ve heard the same mantra from Bears fans and the media alike. The Bears needed to improve their defense this offseason. That’s why the Bears spent so much money on the defensive side of the ball in free agency, and that’s why the first three draft picks the Bears made this year were on the defensive side of the ball. So of course the player local media has written more words about this last week than anybody else is the undrafted quarterback who is trying to catch on as a running back. And it’s not just the articles, because if you follow Bears beat reporters on Twitter you know that Jordan Lynch is mentioned in at least half of their tweets these days. Which is a lot of time devoted to a guy who, at best, would be the third-string running back. The Bears didn’t draft Ka’Deem Carey to give his carries to Jordan Lynch. Don’t get me wrong, I get it. Lynch is the local kid who went to a local school in Northern Illinois, and took Northern Illinois to places Northern Illinois never should have gone to. Now he’s trying to do the same thing for himself in the NFL, making the move from quarterback to running back in an effort to become a professional football player. It’s also a pointless story, and one that’s going to end fairly soon. I have nothing against Jordan Lynch, either as a person, or as a football player. I enjoyed watching him play in college at Northern Illinois, but I harbor no delusions over who Jordan Lynch is. He’s definitely not an NFL quarterback, and he’s probably not going to be an NFL running back either. It’s a lot easier to run over linebackers and defensive backs in the MAC than it will be in the NFL. So I can’t help but get annoyed when I see the one thing that local media members keep asking about is a player who isn’t going to make the team. There’s going to be competition at linebacker this year, at the backup quarterback position, on both the offensive and defensive lines, in the secondary, and on the offensive line. Really, the only positions on this Bears roster that are set are Jay Cutler’s, Matt Forte’s, Brandon Marshall’s and Alshon Jeffery’s. Everything else is up for grabs, and as a Bears fan, I’m very interested in finding out information on the other position battles will take place. 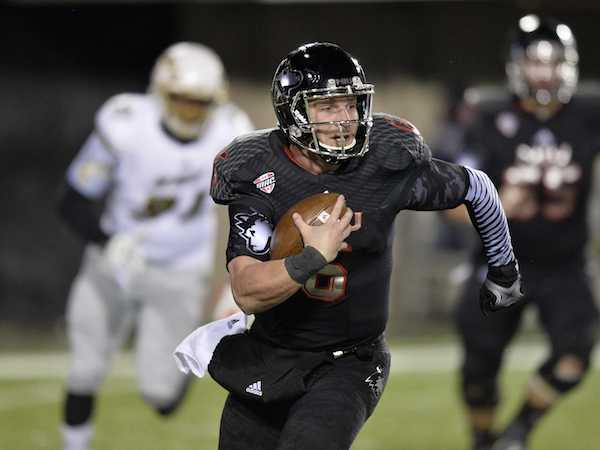 But every day, whether in the paper, on the web, or on Twitter, there it is: Jordan Lynch is making the transition to running back, and he hasn’t died yet! He’s still alive! He’s got a chance! What a story! As I said, I get that it’s a good story, and I would certainly understand a feature being written on it at some point. But there simply can’t be enough interest in Jordan Lynch to demand this kind of attention, can there? The local media seems determined to find out. This entry was posted in Chicago Bears and tagged Alshon Jeffery, Brandon Marshall, Jay Cutler, Jordan Lynch, Ka'Deem Carey, Matt Forte, Tim Tebow by Tom Fornelli. Bookmark the permalink.